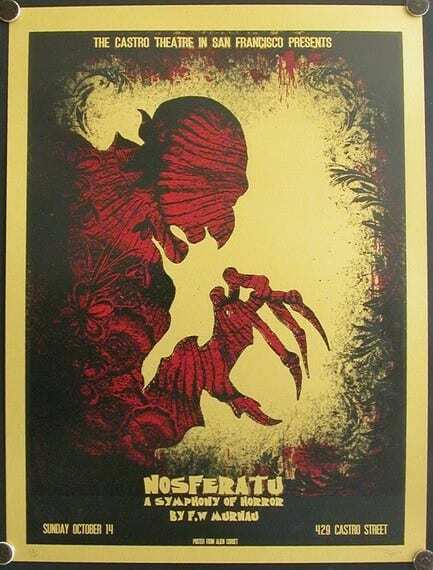 I’m sure if you’re a real horror fan, you’ve heard of the 1922 movie Nosferatu. It was one of the first real horror movies, made in Germany just after World War I. It had a large influence on vampire lore, because it made them vulnerable to the sun. Before, vampires were often weakened by sunlight, but exposure would not kill them. The plot is based on the novel Dracula, but it takes a lot of liberties because the filmmakers didn’t have the license to make the film. It’s about a clerk named Thomas Hutter, who goes to Orlok’s (the vampire, or “nosferatu”) castle, and, blind as he is to the fact that Orlok’s obviously a vampire, even though he just read a book about it. Hutter sells a house to Orlok, who then goes to the city of Wisborg, to go on a killing spree. He dies when he is feeding of the blood of a pretty woman. Distracted as he is, he doesn’t notice the rising sun and vanishes in a cloud of smoke. The movie is known for its haunting atmosphere, and Orlok’s presence is always frightening, even if you can only see his shadow. Some of the shots are colored, but only in one color, to add a feel to the scene. 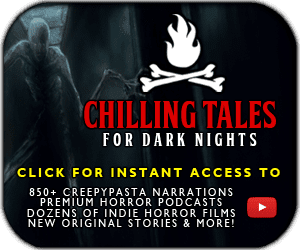 If all of this sounds familiar, you’ll also know that the movie was banned for copyright reasons, causing the company that made it, Prana Films to go bankrupt. But just paying the sum of money to Stoker’s widow (who, by the way, also dated Oscar Wilde. History is weird, right?). No, every single copy of the film had to be destroyed. Stoker’s widow had little to gain from suing the film, she only needed the money because she was in financial trouble, and she didn’t even see the film. There was no real reason for her or the court to banish the film from existence. But apparently, it was not gone forever. So why can you still watch the film on YouTube? Well, in the late twenties, it became clear that some cinemas that had kept copies of the film in secret and started showing it again, because by this time the court apparently no longer cared. Now this is the part where it gets crazy. Last week, I was on universalmonsterarmy.com, a forum for old horror movies. It’s the kind of forum where you discuss obscure interests or trade rare collector’s items, the kind of forum that’s silently active in some corner of the internet without the general public knowing or caring. It was in the silent movie subforum, where usually a topic got posted once a month or so. Usually, those topics are about whether anyone knows where to get a good copy of Nosferatu or, once in a while, The Cabinet of Doctor Caligari. 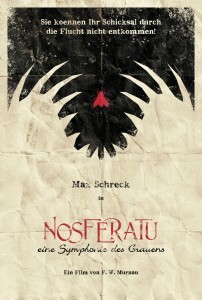 The title of the topic read simply: “Nosferatu”. I assumed it was nothing special, so I clicked it, ready to give a link to eBay. I can remember that it was pretty long, but after the recent events it got deleted. I’ll try to recap it while I can. The poster, whose username was simply “rudolf” (without caps), to my surprise, didn’t want a copy at all, he just wanted our opinion on the movie, and had posted a few screenshots just for fun. I was already typing my comment when I noticed something was off about the screenshots. I didn’t know what it was, but I figured I would just watch the movie one more time on YouTube. I was busy with my job (I’m a waiter, and it was the start of the holidays), so I couldn’t return to the forum until after a few weeks. I was browsing again when I remembered the Nosferatu topic. When I checked the comment section it struck me what was wrong with the screenshots: They were not from the movie at all. I couldn’t recall any moment in the film where Orlok was walking like that in the mountains, or staring at the screen from that angle, or Hutter running near the river. The other commenters had noticed as well, and called “rudolf” out on it. There was a response from Rudolf, saying that these were definitely in the movie, and that their summary of it wasn’t correct. I was intrigued, but not interested enough to keep reading, so I moved on to another topic. A few days later I was browsing again, in the music subforum, when I saw that Rudolf had posted a reply. He said that added music didn’t belong in silent horror films and that the silent version was the only true version. I remembered the thread, so I returned to it. Apparently Rudolf and the admins didn’t get along very well anymore. The admins demanded to know where he got the screenshots, and Rudolf insisted that this was the original version, he even posted a picture of the plastic strip. I didn’t believe him for a second, and posted a snarky reply, saying that he was just trolling us. Now I was following the thread. No one really took Rudolf seriously anymore, even though he continued to post more “screenshots” of the film. After a while the debate got so heated that Rudolf said he would record the full movie with his camera, and post a link to the whole movie on Friday (at midnight, for good measure). All of us were interested now, and even though no one really knew what it was going to be. In the weeks that the forum thread was active, nearly all of us had posted replies. Some of us speculated that his copy was really an amateur fan film that he mistook for the real one, or cheap imitator with some added and deleted scenes. Some even believed Rudolf was right. In the following days, the nature of the film he would show us became the main topic to talk about on the forums, with a ton of other theories being submitted. When the Friday night came, there was an unusually high number of online members. After about 10 minutes of waiting and watching the other members complain, he finally posted a link to Megaupload, which I clicked. After I had downloaded the file and opened it with Media Player. I don’t remember the entire movie, but what I do remember still haunts me in my dreams to this day. The first thing that hit me was that I was seeing the film being projected, so this really was a plastic strip. Didn’t see that one coming? Well, just wait, it gets better. The title cards were in German, so apparently, this was either a really old imitator or just the normal Nosferatu. The movie started normally, with Hutter and his wife, Ellen, being introduced to the audience by being shown at home. A few minutes later Hutter had departed on his journey to the count’s castle. Nothing was really out of the ordinary, except for a few camera angles that seemed slightly different and some shots I had never seen before. Hutter reacted to this the same way as in the real version: by simply throwing the book away. Afterwards, he took the carriage like in the real version, but the woods looked much more dense, and it was evening instead of daytime, so everything was a lot harder to see, though there was a large moon in the sky. By this point my eyes were glued to the screen, I had no idea what was going on. Unlike the normal version, where the coach drivers leave Hutter near the road because of their superstition, here, they brought him all the way through the woods. The scene was much longer, and I thought I could see something move in the woods, maybe or maybe not. What felt like an hour later they reached the castle, and Hutter entered the courtyard, at lot more cautious than in the normal version. That’s when Orlok first fully appears in the regular version, but here, there was no one there, so Hutter just entered the castle. Inside, some walls looked distorted or darker. Hutter was looking very uneasy. Then Orlok came in. He looked just like in the regular version, tall and thin, with his ridiculous hat and eyebrows, and yet there was something different about him. Something about the eyes, I think, yet I could not tell what it was. Like in the real version, his presence brought a chill down my spine. The screen froze. I checked if it was Media Player freezing, but it wasn’t. The film remained frozen for abfout 5 minutes, with Orlok at the middle of the screen. I felt that he was somehow coming closer, but the shot seemed to remain still. When the still shot finally ended, Orlok just sat down like in the regular version, his eyes fixed upon Hutter. Hutter began eating the food (somewhat nervously), while Orlok was examining the contract. Now, if you’ve watched the film several times you will know that in the regular version the contract is covered in all kinds of hermetic symbols and symbols of the occult. 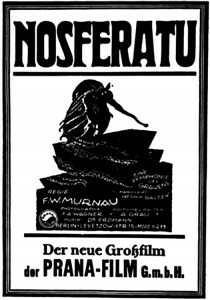 This is due that the production designer was Albin Grau, an architect and member of the occult group “Fraternitas Saturni”. He was also responsible for Orlok looking like he did. The contract looked exactly the same, unlike many other things in this version of the film. Then came the moment that Hutter cut himself. Instead of rushing forward like in the other version, Orlok looked surprisingly still, and Hutter just cleaned it off. This surprised me greatly, because that’s when the audience knows for sure that Orlok is Nosferatu in the original version. After handling the contract, Hutter went to his room, mistrustful of the whole situation and unable to lock the door. After several minutes of paranoia, Orlok finally came in (for all the fans, this is the part you see in Spongebob). 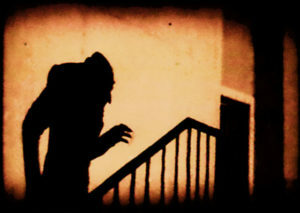 Hutter, who by now knew of Orlok being Nosferatu, faints in fear. The screen then cut to Orlok’s smiling face, slowly zooming in, then abruptly stopping. In the next shot, you can see Ellen wake up, due to the bond she has with Hutter. Next, the screen showed footage I’ve never seen before. It looked like some kind of wildlife documentary, about rats. I’ll not describe it in too much detail, because it’s not important to the plot and pretty disgusting as well. This was, like the previous page, on the screen for quite long. I was still wondering how all of this made sense, but I couldn’t. Hutter, unlike me, didn’t seem impressed and began wandering the castle. Eventually, he made his way down the stairs and came to a dimly lit underground room, the crypt. Just like in the regular version, he discovered the coffins. In the real version, he opens one of the the coffin and find out that Orlok is in it. Frightened, he flees. That didn’t happen here. Carefully stepping though in the crypt, he opened the coffin. Suddenly, the screen went pitch black. I waited for 3 minutes in anticipation for what was to come, because by this point I had no clue where the film would go next. Then, surprisingly, the screen went back to the book page. When the screen cleared, the coach from the normal version departed in the distance, presumably with Orlok and his coffins in it. It then cut to Hutter escaping the castle through the window, but being knocked unconscious by the fall. Next was the ship scene, in which the crew of the ship carrying Orlok were all infected by the rats from his coffin, carrying the plague. The ship was different, but for the rest it was the same. After the rest of the crew died, the first mate jumped into the see out of fear when he saw Orlok, and then the captain went downstairs. The captain, like an idiot, tied himself to the ship like an idiot. Slowly, you could see Orlok ascending the stairs, and then the captain’s surprised face. Orlok slowly walked towards the captain with the strange walk he always uses. For a few seconds, they were looking each other in the eyes, and you could see the captain’s face white from terror. …the book page showed up once more. I didn’t really know what it means, but I knew that “Schicksal” meant fate. And “Ubique Daemon” doesn’t sound very nice to me either. After a while, I saw Orlok’s ship entering the Harbor. In the asylum, Hutter’s former employer, whom Orlok made into his slave could see him coming. Orlok exited the ship and moved into his new house with his coffin, and the dead bodies were dragged of the ship for research. Their death was attributed to the plague due to notes from a diary found on board. As of now, the whole movie had been mostly the same, except for a few minor differences in text and minor details. The climax however, was what really made the movie so terrifying. In the regular version, people in Wisborg get killed by Orlok, their deaths are attributed to the plague. Knock also escapes, but is quickly recaptured and Ellen sacrifices herself to kill Orlok after reading the book from the inn. Hutter comes back with professor Bulwer (basically Van Helsing) to save her but it’s too late. That’s it, you can see his ruined castle a few shots later to symbolize his death. This ending was radically different. For one, the night scenes (all of them) in this version were really filmed at night (and the street lights, as you see in a minor scene, are unlit, because people are too scared to go outside), contrary to some of the regular version. This made everything very hard to see, except some of the scenes inside which were lit by lamps. She looked shocked by this text, but she is comforted by Hutter, who lays his arms around her. Like in the real version, Ellen points to the window, saying that she sees something there every night. Only this time, the shot from out of the window showed not Orlok’s house, but the darkened night sky, with no moon in sight. After that, you can see the villagers talking to each other about Knock’s escape, and about how he should be caught. This scene is the same as in the regular version. One thing though, in the regular version he somehow ends up back in the asylum near the end. This didn’t happen here. Hutter departed to bring Professor Bulwer to inspect Ellen’s illness, as you can see her fearing for her husband to get infected. After this, you could see Hutter running besides the river to get Bulwer. Once he get’s to Bulwer’s house, the sun has already set and I could barely see what was happening. Meanwhile Ellen is slowly being hypnotized by Orlok, and opens the window. In the next shot, I saw Hutter and Bulwer running beside the river (Bulwer was carrying a lantern, so you could see what was happening clearer than most of the night scenes), until they had reached a dark, empty tunnel. They paused, maybe to see if there was anything in there, but it was too dark to see anything. Slowly and casually, they entered the tunnel. The lantern only showed a small piece of the wall, which was thick with moss. Suddenly, I could see the silhoutte of Knock in the distance and the screen froze, as before. After a waiting for what seemed like 4 minutes, Knock was approaching fast, as if the screen had been lagging, and Hutter and Bulwer were standing there, half offscreen frozen in shock. When he had reached the two, Knock reached his arm towards Bulwer, preventing him from fleeing, and bit him in the neck. Bulwer, seeing that his end was near, commanded Hutter to run, as he dropped the lantern in an attempt to scare of Knock, but the flame was quickly extinguished. I saw Hutter trying to save Bulwer, but Knock’s grip was too tight so he ran away. …again. I wasn’t even surprised this time, but I kept watching because I had to see the ending of this film, to see what happened. Hutter was hurrying towards his house in the darkness. When he had entered the door however, someone was blocking the stairs. It was Orlok, with that frightening grin across his face. Hutter, hypnotized, was unable to move as Orlok came towards him, and launching his teeth into Hutter’s neck, making the blood flow down his clothes. For a moment, it seemed like he would protest, but the he remained still. After about 30 seconds, in which he also bit Hutter across his arm and several other places Orlok left. …came up again, and you could see the staircase scene from the photo on top of this page, which was now truly unnerving. I will not describe Ellen’s death here, believe me, it’s better this way. All I can tell is that it puts the previous scenes to shame, and that things didn’t quite end well like in the other version. There was no rooster that crowed, no sunrise, no sign of victory for good whatsoever. The shots thereafter were of Wisborg by night, presumably years later, now an empty city inhabited only by rats and vermin. The very last shot of those was of Orlok’s triumphant smile, his mouth dark with blood. The camera, like before, slowly zoomed in on him, on his eyes, and at that moment I felt a kind of dread that’s hard to explain, an odd sense of somehow being trapped. After that, there was only one cut left. That was the end (there were no credits). I clicked away Media Player, which had now stopped playing for real, and deleted the file, never wanting to play it again. After a few days I decided to go back to universalmonsterarmy.com to see what happened. I found that the silent movie subforum had been deleted, and its topics were nowhere to be found in the graveyard (deleted topic subforum). I searched for Rudolf’s user page, which was apparently no longer there (which was odd, considered that at most forums a user will simply get banned, but their page can still be seen.). Maybe it has been blocked from the search engine, I don’t know. I tried to talk about it with a few fellow forum members and admins, but they seemed reluctant to talk about it and often tried to change the subject. The forum still exists, so maybe you can see what happened. I myself barely use the forum anymore. The days after watching the movie, I found that I had a hard time sleeping and that I was losing a lot of hair. This was probably from the stress of getting through the movie and overthinking it, but I can’t lose the idea that the movie somehow… Infected me. After thinking about the movie while trying to sleep, I got the idea that maybe, the summary on top of this page is wrong, and that the copies of Nosferatu weren’t destroyed because of copyright infringement. 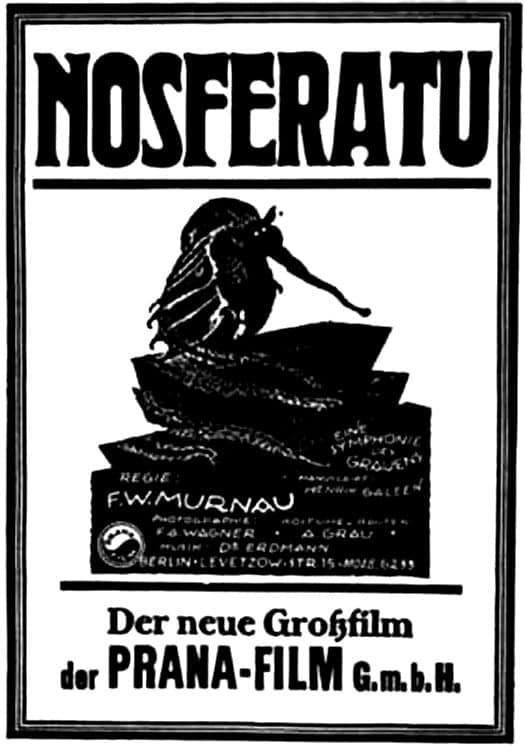 Maybe, the true version of Nosferatu barely survived at all, and the “regular” version is only a cheap copy, made by other filmmakers trying to cash in on Nosferatu’s name, or maybe the “regular” version is a combination of real and fake footage, as evident by some continuity issues (like Knock inexplicably being locked up again).